I started We Make Footballers in April 2018, alongside my full-time job in London which I commute to 4 days a week. After 30 years in the IT sector, but always staying in the game through my coaching at a local Grassroots club, I decided to pursue my passion for football. I now run WMF on a Wednesday by managing the business side of things in the morning and coaching in the evening. Since joining We Make Footballers, I have also started a scouting role with Luton FC and helped players get into grassroots football too. It’s been fantastic to create opportunities for players. It’s great to always have new trialists coming along, receive positive feedback from parents and see our players grow more confident in their football. 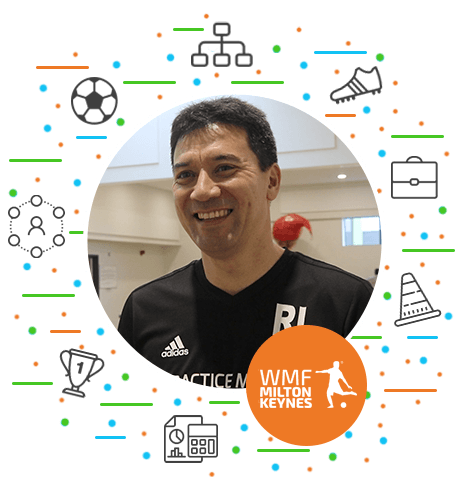 I’ve had a great journey so far and look forward to the future for Milton-Keynes WMF! I’ve only been signed up since April but it seems a lot longer as I’ve settled into the routine and am comfortable running the business. Since We Make Footballers, I’ve personally developed as a coach using the syllabus and ensuring each week of training to benefits every player. Previously, I was unfamiliar with social-media marketing, but, since starting with WMF I’ve embraced online and social marketing to engage with customers. The support from Head-Office has been really useful as they’ve helped guide me through. Eve and Rory have helped with guidance, material and information which has been invaluable.